Zozan is part of the Tentative list of Iran in order to qualify for inclusion in the World Heritage List. 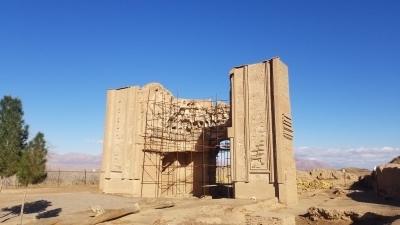 Apparently closely pronounced to “Susan” was a town with a huge project: build two opposing arcs that would be a unique mosque (Malek Zozan Mosque). Yes, I can picture it. Yes, I would love to see it. It would probably be one of the top sites to visit. Alas, they never completed it and the city is now in ruins. Who is at fault? The Mongolian Empire! Harsh. So the only brick building in the area is still visible but in a devastated fashion. Some mosaics are on the walls and scaffolding for renovations or study, either way there is not much left to see. I still enjoyed coming, if not for the fancy street lights that dot a gravel path, or the signs that explain enough to make me want to Google half the stuff and learn more. The mud clay buildings around the area are nothing to look at. They are not even fenced off, only the main site and nobody was around. I did see someone drive the opposite way towards the ruins later though, maybe a caretaker. There was also some new scaffolding being put together in the center for some reason. Big plans? As I see it the site has no chance to be inscribed due to the lack of leftovers. I have seen stuff inscribed looking worse than this but nevertheless it would be a stretch. It is a monument and should be protected, for sure, but world heritage? Not everything needs that title. Ifl you are in the area for the windmills it is something to check out.